Toyota drivers Fernando Alonso, Sebastien Buemi and Kazuki Nakajima scored their third consecutive World Endurance Championship race victory at Silverstone. The two Toyotas were again in a league of their own at the head of the LMP1 field, but the fight between the two cars ebbed and flowed over the course of the race. Alonso overtook Mike Conway in the #7 Toyota in the third hour to assume the lead for the #8 crew, and had built a five-second advantage that was eliminated by a safety car period caused by a bollard coming loose at Brooklands. Nakajima took over from Alonso thereafter but lost out to Jose Maria Lopez, who replaced Conway at the wheel of the #7 machine and went past in the fourth hour before escaping to the tune of 14s. The #8 Toyota had a nose change at its next stop, when Buemi took the wheel, and a rear-bodywork change for the #7 machine with a little over an hour on the clock allowed the Swiss driver to close within striking distance. Buemi resumed just six seconds in arrears of Kamui Kobayashi before he closed in and overtook the Japanese driver with 48 minutes left, going on to take victory by a margin of 19s. The best of the privateers was the #3 Rebellion R-13 Gibson of Gustavo Menezes, Mathias Beche and Thomas Laurent, which ended up four laps down on the all-conquering Toyotas. Beche survived a chaotic first corner in which he made contact with Stephane Sarrazin's #17 SMP Racing BR Engineering BR1, causing both cars to spin and forcing the second Rebellion, the #1 car, off-track in avoidance. 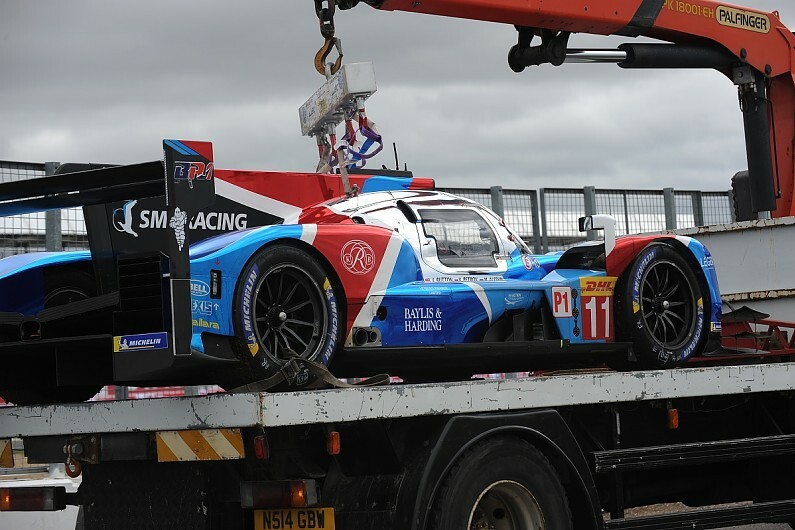 That left the #11 SMP BR1 as the best of the non-hybrids in the early part of the race, but the car shared by Jenson Button, Mikhail Aleshin and Vitaly Petrov retired with an apparent engine problem before the one-hour mark. Neel Jani and Andre Lotterer appeared on course for the final podium spot up until the final hour, when they dropped behind their team-mates in the #3 car with a late pitstop to change rear bodywork. Sarrazin and team-mate Egor Orudzhev took fifth in the surviving SMP BR1, falling further behind the Rebellion cars as a result of contact with the #71 Ferrari GTE car that gave it a puncture and a subsequent brief stop on the entry to the pitlane. DragonSpeed's customer BR1 finished up 32 laps down after a succession of long stops, while debutant Rene Binder brought ByKolles' race to an early end with a spin during the first full-course yellow period as he encountered traffic on the Wellington Straight. Jackie Chan DC Racing scored a dominant one-two finish in the LMP2 division, the two Jota Sport-run ORECAs finishing two laps up on their nearest opposition. The #38 car of Ho-Pin Tung, Stephane Richelmi and Gabriel Aubry that prevailed, despite having to make two extra pitstops - one for Tung jumping the start and the other when the car ran out of fuel during the safety car period. All-Malaysian #37 crew Weiron Tan, Nabil Jeffri and Jazeman Jaafar lost time with a puncture but ended up just 1.9s adrift of the #38 car at the flag. Jackie Chan DC Racing's only serious rival, TDS Racing, fell out of contention when the #28 ORECA suffered a broken toe-link and a puncture in quick succession, handing third place to Signatech Alpine. Anthony Davidson took fourth on his LMP2 debut in the DragonSpeed ORECA he shared with Pastor Maldonado and Roberto Gonzalez, which was beset by issues - including a first-lap stoppage and two late-race penalties. Ferrari scored its first win of the season in the GTE Pro category, with #51 duo Alessandro Pier Guidi and James Calado taking a comfortable victory. Ford assumed control of the race in the second hour after the chaotic start shuffled the order, but the #66 car of Olivier Pla and Stefan Mucke dropped out of the lead fight when it had to change a left-side door. Team-mates Harry Tincknell and Andy Priaulx looked well-set for victory until the mid-race safety car period, when they were jumped by the #51 Ferrari, and then lost further ground when they pitted immediately prior to a full-course yellow period in hour five. Calado and Pier Guidi benefited from that to assume the lead in the penultimate hour, ahead of the two Porsches, ultimately finishing 14s up on the #91 machine shared by Gianmaria Bruni and Richard Lietz. Tincknell managed to force his way past Michael Christensen's #92 Porsche in the final hour at Stowe and Vale to take the final podium spot in the #67 Ford, 35s back from the winning Ferrari. Aston Martin was fifth with the #97 Vantage GTE shared by Alex Lynn and Maxime Martin, with the team failing to replicate its improved one-lap pace in the race. The sister #95 car dropped out with gear selection issues. The leading BMW, the #81 M8 GTE of Martin Tomczyk and Nicky Catsburg, was sixth, with the sister car suffering a mechanical failure that caused Antonio Felix da Costa's cockpit to fill up with smoke and forcing retirement. In GTE Am, victory went to the #77 Proton Porsche shared by Le Mans class winners Christian Ried, Matt Campbell and Julien Andlauer. The Project 1 Porsche and TF Sport Aston Martin teams were locked in battle for a large part of the race, with TF gaining the upper hand when on-loan factory Aston man Jonathan Adam took over the #90 car in the second part of the race. Both the leading squads were then forced to serve 1m15s stop-and-go penalties for pitting under the safety car, relegating Adam and team-mates Salih Yoluc and Charlie Eastwood to a distant second, 46s down at the finish. Project 1 trio Jorg Bergmeister, Egidio Perfetti and Patrick Lindsey completed the podium ahead of the works #98 Aston Martin.